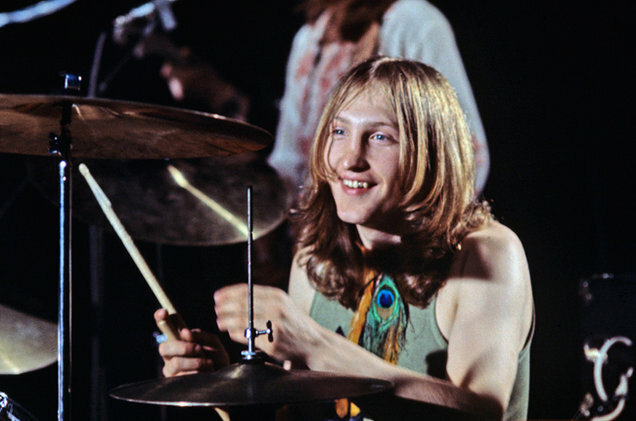 Dale "Buffin" Griffin, drummer and founding member of Mott the Hoople, passed away on Sunday, January 17th in his sleep following a long battle with Alzheimer's. He was 67. The band's manager Peter Purnell confirmed Griffin's death to the BBC. Griffin's death comes just one week after the passing of David Bowie, who penned and produced Mott the Hoople's biggest hit, "All the Young Dudes". After performing in series of bands in his native Herefordshire, Griffin along with bassist Pete Overend Watts, organist Verden Allen, singer/guitarist Ian Hunter and guitarist Mick Ralphs formed Mott the Hoople in 1969. After a series of albums that were modestly received both commercially and critically, Mott the Hoople were on the verge of breaking up when Bowie, a fan of the band, offered them a pair of songs to record. After rejecting "Suffragette City", they opted to record "All the Young Dudes", which became the title track of their 1972 Bowie-produced LP. It became their smash hit. Mott the Hoople continued on for another few years before Allen, Hunter and Ralphs departed the group. Augmented by replacements like Spiders of Mars guitarist Mick Ronson, Griffin and Watts continued on under the moniker Mott. After releasing two further albums under that name, Griffin and Watts recorded music as the British Lions. Decades later, in 2009, Hunter announced that the five founding members of Mott the Hoople would reunite for a series of UK performances. Unfortunately Griffin, having recently been diagnosed with Alzheimer's, was unable to perform in the reunion gigs, although he did partake in the encores portion. "All he ever wanted was for his beloved Mott The Hoople to reform and it was his determination that achieved that very feat in 2009, but sadly by then he was too ill to perform at the five sold-out dates - though he did join the band for encores," their manager told the BBC. "I used to be fearless, but Alzheimer's has stopped me in my tracks. It is my dreadful little bug and I have to fight to keep it from controlling me", Griffin said at an Alzheimer's Society campaign in 2010. "Alzheimer's has prevented me from doing a lot of the things I love - like reading and writing - but I try to keep as relaxed and easygoing as possible. It is really important for people to remember the person and look beyond someone's diagnosis of dementia. Many old friends now avoid me as they do not know what to say, which is really hurtful. I just wish they would realise that inside, I am still the same old 'Buffin' I always was."